The olive fruit is a drupe. Unlike similar drupes like peaches, apricots, cherries etc. olives cannot be eaten straight from the tree. The olive contains a distinctive, bitter principle called Oleuropein. Oleuropein has a strong, bitter taste and although it is harmless, it has to be removed before the olives can be consumed. Olives also have a low sugar content (2.6 – 6%) compared with other drupes (12% ) and a high oil content (10-20%) depending on the time of year and cultivar. We found the best way to process table olives is through a long, slow, natural fermentation in a brine solution. 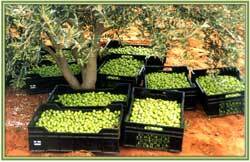 This process ensures that the olives maintain most of there natural goodness and rich olive taste. Green olives receive a lye treatment, before it is placed in large tanks with a brine solution. Black olives are simply rinsed and then placed in the tanks with brine. This process asks for careful monitoring of various factors throughout all the stages. It can take up to 9 months before the fruit are ready for packing. There are however other, easier and quicker methods which you might find more suitable to use at home. Unfortunately, with these methods most of the natural goodness and taste of the fruit is lost. For this reason it is necessary to add flavour in the form of vinegar and/or herbs like garlic etc. 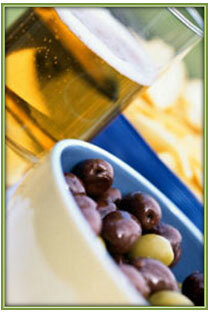 In South Africa fresh olives are available from March to June/July. 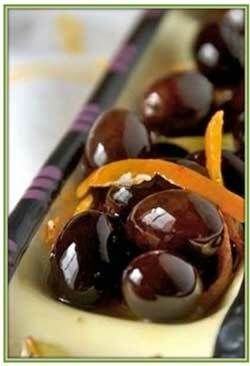 All olives are green initially and turns black as it ripens. Choose the right cultivar. 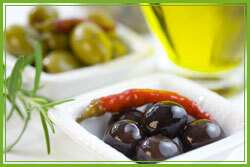 Decide if you want green or black olives and ask at the farm for a cultivar that is best suited. Some cultivars are best processed when still green, like Manzanilla, UDP, Sevillano & Nocellara del Belice. Others like Kallamata and Mission are best processed when black. The fruit must be fresh. Make sure the fruits have been stored a cool place in clean, dry, well ventilated crates after harvest. The fruit must be firm to the touch, not shrivelled and free of any marks due to insect bites or stings. Table olives must be hand picked and handled with care to prevent bruising. Green olives must be full sized, the colour must be a slightly yellowish green. 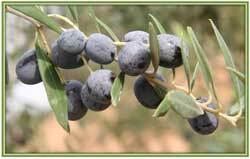 Black olives must be fully ripe, but still firm, the colour violet to violet-black. Hygiene is very important to prevent the olives from spoiling. Make sure all equipment (buckets, spoons etc.) are clean. Also make sure the water you are using is clean, chlorine free and of a high quality. 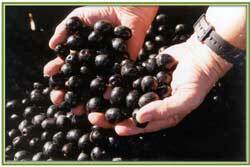 Black olives are washed and left in fresh water for 1 or 2 days. Prepare the brine by dissolving 1 kilogram of salt in 10 litres of clean water. Place the olives into a suitable container (see above) and cover completely with the brine. Make sure the container has a tight fitting lid. Leave to ferment for ±12 months. Taste them from time to time and decide for yourself when they are to your taste. Remove any olives that are floating on the surface. Bottling: Cover with hot brine: 20g Salt mixed into 1 litre boiling water. Cover immediately and leave to cool. Store in a cool place and refrigerate after opening. You may also add a film of good quality Extra Virgin Olive Oil on top of the brine if you like. For those of you who just cannot wait 12 months, this method will be well suited. In the mean time prepare the brine by dissolving 1 kilogram of salt in 10 litre of clean water. 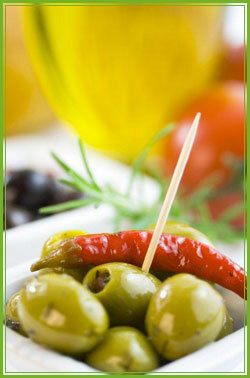 Now place the olives in a suitable container (see Method 1 above) and cover completely with fresh water. Change the water twice a day for a minimum of 4 to 6 weeks. The more bitter you like your olives, the shorter the soaking period. In an airtight container, cover the olives with the brine and allow to soak for 4 months or longer, depending on personal taste. Bottling: Place olives into glass jars. Cover with hot brine: 20g Salt mixed into 1 liter boiling water. You may add a film of good quality Extra Virgin Olive Oil on top of the brine if you like. Cover immediately and leave to cool. Store in a cool place and refrigerate after opening. If you prefer add sprigs of fresh herbs like rosemary or thyme or a few cloves of garlic or lemon slices. Wash the olives to remove dust and dirt. Make a cut lengthwise through the flesh. (This step is optional). Now place the olives in an airtight container (see Method 1 above) and cover completely with fresh water.